Plenty of research has been done on the cycles in the stock market in the US to gauge the time taken by each of these cycles, which can be used in investment decisions. Such studies are easier in the US where stock market data is available for over 100 years. But the oldest stock market index in India, Sensex, has data available only from 1979. This limits the utility of cycle analysis in India. However, we analysed the Sensex monthly data since its inception to gauge the time taken by bull, bear and consolidation phases by our market. Here’s what we found. Secular trends in stock markets are the long-term trends extending beyond 10 years. The Sensex has displayed a rising secular trend from 1979. Each correction within this trend has been followed by a higher peak, establishing a positive long-term trend. Within this secular trend, there are cyclical bull markets, bear markets and consolidation phases that have lasted anywhere between a few months to a few years. We narrowed the definition of a cyclical bull market to those market phases that have resulted in the Sensex gaining almost 100 per cent without any significant correction. We have seen nine such phases since 1979. The gains in these phases have ranged from 96 per cent to 622 per cent and the time taken has varied from 8 to 56 months. It was, of course, the bull market between 2003 and 2008 that gave the largest gains and lasted the longest. There were corrections within this phase that were very short in magnitude or time taken to qualify as bear phases. If the 2003-08 bull market is excluded, these rallies have averaged a return of 160 per cent in 15 months. We have defined a cyclical bear market as one where the Sensex lost more than 40 per cent. There have been five instances since 1979 when the Sensex has fallen in this pattern. We have classified the correction between 1994 and 1998 as sideways correction since it lasted for an inordinately long period with a range-bound movement. The average decline in these falls has been 51 per cent with the maximum decline at 62 per cent in 2008. The fact that we have not had a decline greater than 62 per cent helps to underline the fact that our equity market is in a secular bull phase. The time taken by these bear phases has at most times been equal to the bull phase, at about 14 months. Sideways moves can appear in both a secular bull and a bear market. When the reversal results in limited price correction, but lasts for an extended period, it results in a sideways moving market. These kinds of moves are also common both when the market is building a base from which to launch the next upmove; and when it hovers for long near a peak before giving way. These are the most exasperating periods when prices fluctuate in both directions with no headway made either up or down. Investors often resort to sector rotation during these periods. There were three such phases prior to the 1990s, resulting in index movement of between +4 per cent and -15 per cent. The average time taken by each of these phases was 21 months. One extended sideways correction that many old-timers in the market would remember is the one between September 1994 and November 1998. This was the longest sideways phase lasting a protracted 50 months. But then the market needed this time to adjust to the wild excesses of the Harshad Mehta-led bull market in 1994 and the IPO frenzy in early 1994. Our market too has an election cycle similar to the Presidential cycle in the US. According to this cycle, stocks tend to rally during the first two years of rule when a stable government is formed at the centre. Coalition governments result in sub-par stock returns in the election year. There are also some months which are better for stock investors. Since 1979, Sensex has recorded the maximum positive closes in December. October and March are the worst months for stocks according to this metric. Iran deal knocks oil lower, bolsters risk appetite. Iran Nuclear Deal Done. 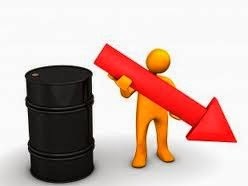 Oil prices fell sharply on Monday after Iran and six world powers sealed a deal curbing its nuclear programme, a fillip for global economic growth and risk appetites that should benefit share markets. The agreement, reached late Sunday, gives Iran some relief from crippling sanctions. While it will not be allowed to increase its oil sales for six months, any easing of Middle East tensions tends to lead to lower crude prices. Brent crude oil shed $2.29 to $108.69 a barrel, its biggest daily drop in a month. U.S. oil dived $1.09 to $93.75 a barrel. Jim Rogers Blasts "Abolish The Fed" Before It Self-Destructs. 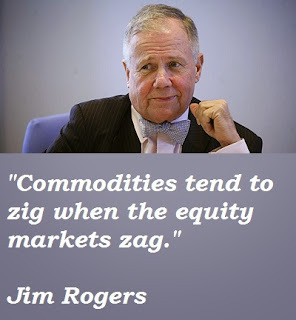 "The world has consumed more than it produced for more than a decade," Jim Rogers explains to BoomBust's Erin Ade; but his comments to the leather mini-skirted anchor with regard the actions of the world's central banks bear the most attention. "The world is floating on an artificial ocean of printed money," he blasts, adding that while it's going on "everyone's happy," but at the first sign of it slowing, he warns, "we will all dry up." Rogers sees gold as a crucial holding in this respect but believes there will be a better price to buy more, as he reflects on the suppressive actions of the Indian government. This excellent far-reaching interview covers everything from gold standards to China's 3rd Plenum "I much prefer the Chinese system of open markets than the US with the government dictating everything" and from Bitcoin to a barbaric destruction of the Fed and all it stands for, "the Fed will self-destruct, before the polticians realize what is going on." 6:25 Central Banks - "for the first time in history, all central banks are printing money... The world is floating on an artificial ocean of printed money,"
7:15 Gold - "I am not selling any of my gold, but believe there will better prices to buy... the Indian government is actually trying to make its people sell their gold." 8:45 Gold Standard - "it might work for a while but eventually the politicians will cheat that too"... "people wil be desperate in the next decade to try anything - maybe it will be bitcoins"
10:15 China's Plenum - "the Chinese are becoming more and more capitalist"... they are becoming more and more market focused... as opposed to the US where when there is a problem "the government decides how to fix it... look at Obamacare" - "the government says "we will figure out the solution"... "I much prefer the Chinese system of open markets than the US with the government dictating everything"
15:20 The Fed - "The way the world has worked for a few thousand years is - that when people get into trouble, they fail; competent people come along, reorganize the assets and start over..." In America, he chides, "they decided to let incompetent people take over the assets from competent people and compete with the competent people." - The Japanese tried this in the 90s and it failed for 2 lost decades. "In America, they are kicking the can down the road, and when the can finally goes over the side, we are all going to go with it." "We've had 50-60 years of excess in America, you've got to pay the price some day whether you like it or not... the longer they delay the day of reckoning the worse it will be." 17:40 Abolish The Fed - "the world has gotten along very well for most of history without central banks." "we would be better of with no central bank, than this central bank"
19:00 Stocks - "we are certainly gonna have a crash some day" - "as long as they keep printing money, and no restraints on congressional spending, this bubble could go on forever"
Weekly Economic Data for the week 23-Nov-13 to 29-Nov-13. Technical Analysis - MCX Copper, Nickel, Lead, Crude Oil & Natural Gas. 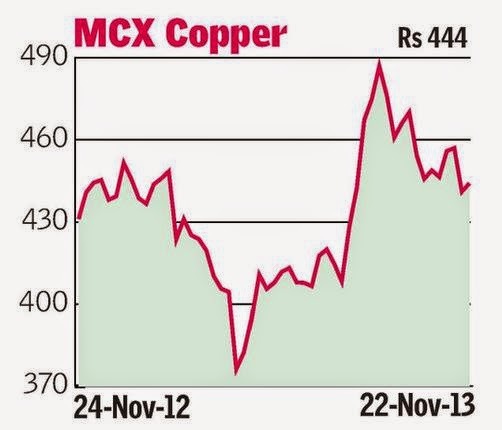 The MCX copper declined below Rs 440 last week. But taking support from the 200-day moving average (currently at Rs 428.8), it jumped back. Now, it is close to the resistance zone of Rs 448-457. If the contract can sustain above Rs 440, a rise to test this resistance zone looks possible, but it may not breach Rs 457. On the other hand, a decline below Rs 440 can take the price lower to test the 200-day moving average again. The MCX crude oil contract has risen well from the low of Rs 5,752 last week. The contract looks to be gearing up for a corrective rally. Immediate support is at Rs 5,900. The contract can rise to Rs 6,250 in the coming week on breach of the intermediate resistance at Rs 6,100. An eventual break above Rs 6,250 can take the price further higher to Rs 6,550. For the medium-term, Rs 6,600 will be key resistance level. Whether this resistance holds or gets broken during this corrective rally will then decide the trend. The MCX natural gas contract is heading towards the upper end of its short-term sideways range of Rs 210-240. Failure to breach Rs 240 can result in a decline to Rs 220 and the contract can retain this range for the next few weeks. However, the medium-term outlook is bullish as the contract has been moving in a bull channel for more than a year. The channel support is at Rs 200. As such, declines to the Rs 210-200 zone can attract fresh buying interest in the market. A bullish breakout above Rs 240 can take the price higher to Rs 270. 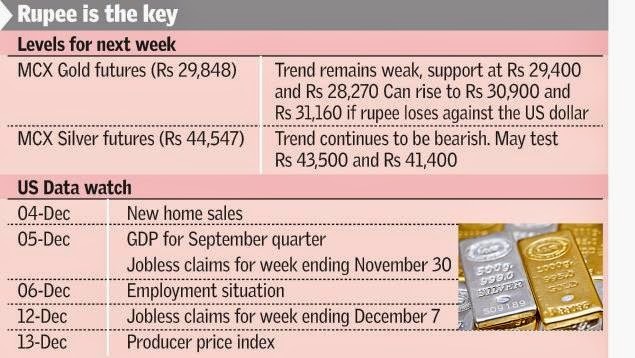 After the sharp fall below the 200-day moving average on Monday, the MCX nickel contract stayed flat between Rs 840 and Rs 855 for the rest of the week. The short-term outlook is bearish with the 200-day moving average resistance at Rs 861. Although there is support at Rs 840, the contract looks vulnerable to break this support and decline to Rs 800. The medium-term outlook is also bearish as long as the contract trades below the key resistance at Rs 900. The medium-term target will be Rs 740 on a breach of the key support at Rs 800. The MCX lead contract recovered very well from the intra-week low of Rs 127.6 to close flat for the week. Immediate resistance is at Rs 133, a breach of which can take the price further higher to Rs 136 for the short-term. Short-term support is at Rs 128 and at Rs 125. However, the medium-term outlook is bearish. A strong break above the key resistance at Rs 136 is required to turn the outlook positive. While below this resistance, the contract can decline to Rs 115 in the medium-term. As such, fresh selling can emerge on the short-term rallies to Rs 136. The bear market in gold is getting ferocious with the yellow metal moving steadily lower with every passing week. At $1,241/ounce, gold was down 3.6 per cent in the spot market last week. The minutes of the Federal Open Market Committee meeting that came during the week hinted that a consistent improvement in economic data would warrant trimming of the stimulus measures. Also, the number of new claims for jobless benefits in the US fell sharply to 323,000 in the week-ended November 16, down 21,000 that was far steeper than expected, signalling a strong recovery in the labour market. Holdings in the SPDR Gold trust — the world’s largest gold-backed exchange traded fund, continued to drop. Last week investors of the fund sold nine tonnes of gold and the fund’s holding was reported at 856.7 tonnes. The fund had a holding of 1,350 tonnes of gold in January this year. In the domestic market, gold imports haven’t kicked off. The metal continues to sell at a premium to international gold. Demand for gold ETFs continues to be lacklustre. Daily volumes in goldBeES — the largest domestic gold ETF — in the week ending November 22 was 20,000 units, down 40 per cent over the average in the previous two weeks. MCX gold dropped 1.6 per cent last week and closed at Rs 29,848/10 gram. MCX silver too closed with losses at Rs 44,547/100 gram, down five per cent. Daily volumes in MCX gold contracts averaged at 78,000 contracts in the week, improving from the previous fortnight average of 60,000 contracts. Over the next two weeks, the new home sales data, jobless claims and producer price index are to be released in the US. On December 5, the second estimate of the GDP growth (for September quarter) based on more complete data will be released. Each of these is crucial to know how soon the Fed will start tapering its stimulus measures. If the Federal Reserve begins to scale back stimulus, interest rates would rise in the US. This would make gold less attractive compared with the US dollar. Domestic market gold traders would have to keep an eye on rupee movements. Gold has been holding up at Rs 29,000 to 30,000/10 gram only because of the weak rupee. If the rupee changes direction, gains on the metal will start to evaporate. The rupee has been losing on two counts — one, the outflows from the equities market and two, the strengthening of the greenback on indications of tapering by the Federal Reserve. The dollar index has moved from a low of 78.99 in October to 80.7 now. Gold-silver ratio is inching up — from 58 a few weeks back, it is at 62.4 now. Normally, the gold-silver ratio and gold/silver prices move in opposite directions. With the ratio now heading towards 70-72, it looks like there is more pain for gold and silver going ahead. In the last fortnight, gold behaved in a manner that we had forecast and cut the support at $1,283 and $1,250. In the coming two weeks, it may drop further to hit the June low of $1,187.90. The first support, however, could be at $1,220. MCX gold has been moving sideways between Rs 29,000 and Rs 30,000/10 gram. If the rupee weakens against the dollar in the coming weeks, the contract may rise to touch Rs 30,900 and Rs 31,160. On the downside, supports are at Rs 29,400 and Rs 28,270. MCX silver hit support at Rs 46,953 as we had forecast and is heading further down. In the coming weeks, it can test Rs 43,500 and Rs 41,400.